Revenue in the Online Dating segment amounts to £1,294m in 2019. Revenue is expected to show an annual growth rate (CAGR 2019-2023) of 4.2%, resulting in a market volume of £1,528m by 2023. User penetration is 4.6% in 2019 and is expected to hit 5.2% by 2023. The average revenue per user (ARPU) currently amounts to £3.81. In global comparison, most revenue is generated in United States (£619m in 2019). The segment of Online Dating is made up of online services that offer a platform on which its members can flirt, chat or fall in love. Two noticeable examples are Neu.de and Zoosk. In contrast to matchmaking services, online dating focuses on casual contacting and easy flirting among its members. The users normally carry out the search on their own. In doing so, they can apply search filters with regard to criteria such as age, location and other attributes. Offline dating agencies or online purchased tickets for speed dating or similar events are not included. The user base covers paying and non-paying customers. Reading Support Revenue in the Online Dating segment amounts to £1,294m in 2019. 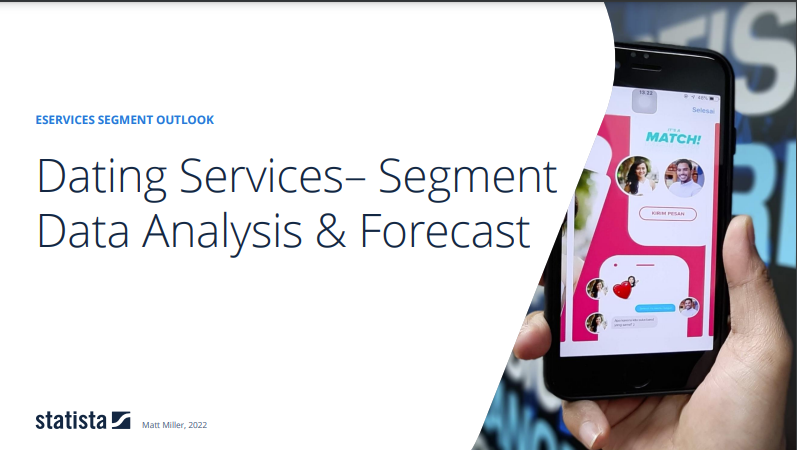 Reading Support The Online Dating segment is expected to show a revenue growth of 6.2% in 2020. Reading Support In the Online Dating segment, the number of users is expected to amount to 397.7m by 2023. Reading Support User penetration in the Online Dating segment is at 4.6% in 2019. Reading Support The average revenue per user (ARPU) in the Online Dating segment amounts to £3.81 in 2019. Reading Support In the year 2017 a share of 42.1% of users is 25-34 years old. Reading Support In the year 2017 a share of 63.6% of users is male. Reading Support In the year 2017 a share of 46.2% of users is in the high income group. Reading Support With a market volume of £619m in 2019, most revenue is generated in United States. Reading Support With a rate of 10.8%, the user penetration in the Online Dating segment is highest in United States. Here you can find more studies and statistics about "Online Dating".